Elasmosaurus was the longest known plesiosaur. It was a marine reptile which swam the Cretaceous Inland Seaway in North America. 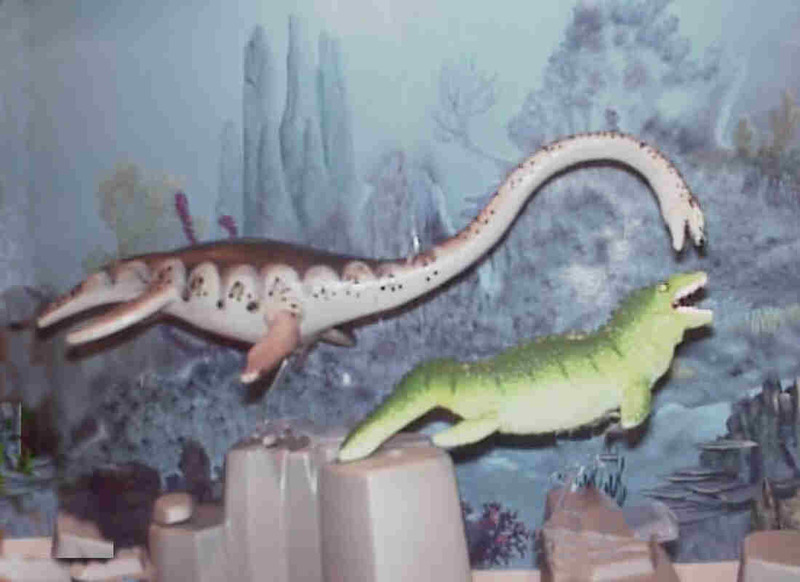 The most intriguing thing about Elasmosaurus was its long neck. Its neck was more than half its total length of 45 feet. Its neck was about 26 feet in length. This long neck probably served to move the head towards the prey with a very rapid darting movement. Its head was relatively small with jaws that had sharply-pointed teeth for catching fish. 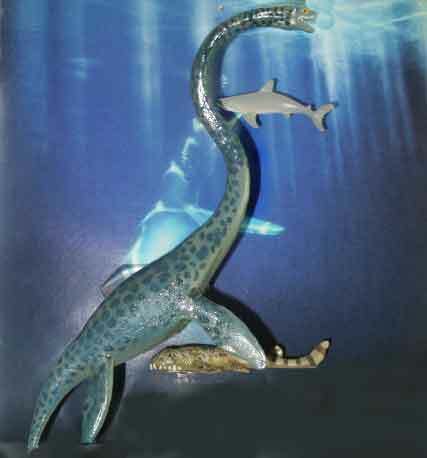 Elasmosaurus had a short body with a small tail and four flippers.It was not a fast swimmer. Its neck made up for this. Its diet consisted of fish and small marine reptiles. 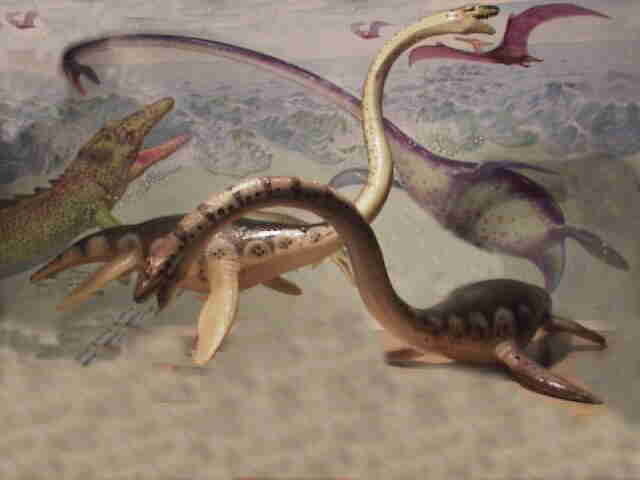 Elasmosaurus, (Thin plated Lizard) size: 46 feet long. It is thought that Elasmosaurus used its flippers to fly through the water like a penguin. Since no evidence of live birth has been found they are assumed to have returned to land to lay their eggs. Mosasaurus (Meuse-River lizard) size 59 feet long. A full-grown Mosasaurus had a 6-foot long skull with 4-foot jaws, capable of opening 3 feet apart. Like modern constrictors and other types of mosasaurs, the lower jaws were two separate units and could spread apart at the anterior end, stretching to give this amazing creature the ability to swallow huge prey. Elasmosaurus had the longest neck of all the swan necked plesiosaurs, with over 1/2 of its length made up of neck. It ate fish, mollusks, and soft-bodied invertebrates. While often pictured with head rearing from the water this does not seem likely given the length of the neck. It seems to have been more flexible side to side than up and down. The long neck must have offered an advantage ambushing small faster prey, while limiting its speed and perhaps making it vulnerable to the newly evolving sharks and mosasaurs. The large size and extreme adaptations of the last plesiosaurs may be a sign they were under some kind of evolutionary stress. One idea is that plesiosaurs declined as modern types of sharks appear.